A beaker from Largantea, Co. Derry, after Herring 1938. New discoveries are transforming how we view the beaker period. Beaker is a style of prehistoric pottery found throughout Europe in the later part of the third millennium BC from Scandinavia to North Africa and from the Danube to Ireland. Early beakers are tall pots with characteristic curving bell-shaped profiles and narrow flat bases that are often decorated with horizontal bands of decoration, although later beakers had a wider variety of forms. Radiocarbon dating indicates that beaker came into use in Ireland during the Cooper Age in the years following 2450 cal BC. Beaker ceased being deposited in burials by about 2170 cal BC but remained in general use when the Bronze Age commenced about 2000 BC and only went out of use entirely about 1900 Cal BC. It is the roughly three hundred years when beaker appeared in burials between 2450-2170 cal BC that I will refer to as the beaker period. In Ireland beaker is found at settlement and ceremonial sites as well as in burials and early copper mines. Until recently Irish beaker burials were only known from megalithic tombs mainly in the north of the island. Discoveries made since the 1990s have transformed the situation. We are now able to discuss two burial traditions, one involving both old and newly built megalithic tombs in the north and a single burial tradition in the south. Beaker period burials are now known from old megalithic tombs with beaker associated burials. They are also known from newly built megalithic Wedge Tombs with beaker associated burials as well as from Wedge Tombs without beaker associated burials. To this we can now add burials with beaker in pits and without beaker in stone cists. In the Beaker period people in the north of the island placed burials accompanied by beaker pottery into megalithic tombs which were already very old monuments. The main old tomb used for beaker burial was the Court Tomb. There are about 390 Court Tombs known that consist of longitudinal chambers under long cairns with forecourt entrance features. At Ballybriest, Co. Derry, for example, an oval cavity resembling a polygonal cist was created in the Court Tomb cairn and the cremated remains of an adult male associated with a beaker were then placed into the cavity. Wedge Tombs are the most common megalithic tomb type known in Ireland, with more than 500 known examples found mainly in the north, west and south-west. Most Wedge Tombs have wedge-shaped chambers with forecourts and round to oval cairns. Wedge Tombs came into use during the period 2540-2300 cal BC at about the start of the Beaker period and broadly contemporary beaker burials have been identified in a number of Wedge tombs mainly in the north. Both cremated and unburnt human remains were deposited in the Wedge tombs although cremation was more common. For example, at Largantea Co. Derry, cremated remains were deposited with what appeared to be whole beakers. Not all the Wedge Tombs investigated contained Beaker pottery. A number of examples have been investigated in the south of the country, like Labbacallee and Island, Co. Cork, that contained human remains but no beaker pottery. This indicates that not all beaker period burials were accompanied by beaker and we should be on the lookout for contemporary pit burials without pottery. There are a number of pit burials containing Beaker now known from the south and east of the country. These burials are characterised as having small token quantities of cremated bone associated with sherds from one or more beakers sometimes associated with large stone artefacts like axes and mace heads, as well as flint and cereal grains. At Lismullin, Co. Meath a pit contained a cremated individual with burnt stone, a fragment of a mace head and sherds of two beakers as well as some Neolithic sherds and a flint flake. At Corbally, Co. Kildare a pit with a scorched base contained cremated human bone, animal bone, burnt flint and a chert barbed and tanged arrowhead with sherds of two beakers. Another pit in the neighbouring townland of Brownstown Co. Kildare contained cremated bone and barley and wheat associated with sherds of beaker. At Brackagh, Co. Derry a a small sub-rectangular cairn that was enclosed by 11 posts covered a pair of stone cists, one rectangular and the other octagonal, within a figure of eight stone setting. The octagonal cist contained the cremated remains of two adults that were dated to 2620-2485 cal. BC. The rectangular cist also contained the cremated remains of two individuals dated to 2485-2342 cal BC. There were no artefact associations with the burials. These cist burials highlight the possibility that other cists containing cremations but no associated artefacts may also date to the Beaker period. The new evidence is transforming our view of burial in the beaker period in Ireland. Two contrasting burial types are now visible, one traditional and centred on megalithic tombs mainly in the north of the island. The other focussed on simpler single graves mainly in the south. The megalithic tombs continued a long tradition of collective burial of both burnt and unburnt remains and the deposition of whole pottery vessels that may have contained organic materials. In contrast pit burials were single graves with only small amounts of cremated bone accompanied by broken artefacts. What is emerging are two different views of burial, one looking to past traditions, the other making a new statement, but both using the international style of beaker pottery. Dr. Charles Mount has been involved in research on the Irish Bronze Age for more than twenty years and has published extensively on the burials, monuments and artefacts of the period. This blog post is based on research he is preparing for a book on the period. You can read more of Dr. Mount’s publications here . Waddell 1998 is an excellent introduction to the prehistory of Ireland which summarises many of the themes and sites discussed here. Herity 1987 has summarised all the finds from the Irish Court Tombs. Schulting et al discuss the chronology of the Irish Wedge Tombs. O’Brien 2004 has published his excavations of the early copper mine at Ross Island, Co. Kerry and set the mines in the context of the Copper Age. For more on the pottery of the Bronze Age read Brindley 2007. Herring 1938, Purcell 2002, O’Connell 2009 and O’Regan 2010 include primary information on the Larngantia, Corbally, Brownstown, Lismullin and Brackagh burials. Herity, M. 1987. The finds from Irish Court Tombs. Proceedings of the Royal Irish Academy 87c, 5-281. Herring, . J. 1938. The cairn excavation at Well Glass Spring, Largantea, Co. Londonderry. Ulster Journal of Archaeology 1, 164-88. O’Brien, W. 2004. Ross Island. Mining, Metal and Society in Early Ireland. Bronze Age Studies 6, Galway. O’Connell, A. 2009. Excavations at Lismullin, Co. Meath 1. National Roads Authority Report. Purcell, A. 2002. Excavation of Three Neolithic Houses at Corbally, Kilcullen, Co. Kildare. Journal of Irish Archaeology 11, 31-75. Schulting, R., Sheridan, A., Clarke, S. And Ramsey, B. 2008. Largantea and the dating of Irish Wedge Tombs. Journal of Irish Archaeology 17, 1-17. Waddell, J. 1990. The Prehistoric Archaeology of Ireland. Galway. A note on some Beaker period pit burials in Ireland. This entry was posted in Archaeology and tagged Ballybriest, beaker, beaker period, Bronze Age, Brownstown, Co. Derry, Co. Kildare, Co. meath, Copper Age, Corbally, Court Tomb, Largantea, Lismullin, mace head, Wedge Tomb by Charles Mount. Bookmark the permalink. Interesting stuff Charles. What do think is the relationship between beakers and food vessels/vases?. Are they an indigenous imitation of the beakers? and is there much over lap in dates? Colm, thanks for the comment. Yes beakers and food vessels do overlap in date, but they don’t occur in the same graves, so it looks as though the use of bowl food vessels took over from beakers in burial after 2160 cal BC. At Tara there are Bowl burials from the chamber of the mound of the Hostages with V-perforated buttons that are usually found with beakers, so it looks like one pot type went out and another came in, but otherwise things remained the same. Beaker continued to be used at other sites till about 1900 cal BC. 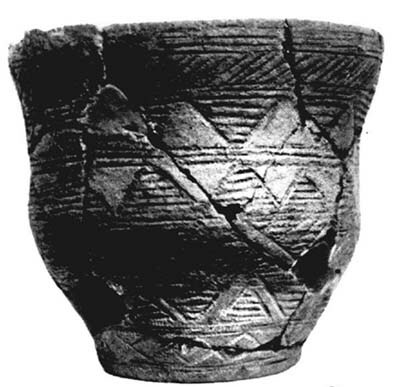 Until recently there was no indigenous precedent for the food vessel single grave tradition, but now we appear to have a beaker one (actually I think there was a Neolithic single grave tradition as well) so we can now begin to discuss food vessel burials as a development from both the Irish beaker traditions. So we get pits, cremation and flat burials from one tradition and cists (which may be derived from Wedge Tombs), inhumations and the re-use of megalithic tombs (even the re-use of Neolithic single grave mounds) from the other.